Friday night… I was all set to read one of my two top choices in my TBR list. I even had one of my Facebook friends choose my next one for me since she had read ’em both. Angsty, action packed romance, or psychological horror story of a kidnapped girl, and we all know how much I enjoy that kind of adrenaline rush. Both books are getting great responses, so either way, I was likely to come out a winner, right? So what the heck happened, for me to go completely off of my book-radar and choose one that I had never heard of before (even though everyone else has ;)). It appears to be an extremely popular new release. It’s getting a TON of great reviews. But I hadn’t heard of it, simply because it wasn’t in the genre I normally troll for my next book-boyfriend. This one is Sci-fi YA, although my husband didn’t mention that part when he found it for me. Yep. I enlisted my husband for my next crazy read. I was in the mood for super-scary apocalypse, lots of frighten-y adrenaline rushes, with a side of romance, and since he’s found me a few exciting reads in the past, that have been out of my comfort zone, I asked him to help. I usually prefer full-on romance, but a BIG story with a smaller romance angle works for me, too, and I was in the mood for that kind of crazy. GAH!!!! I couldn’t download it fast enough. I didn’t even bother with the sample. The numerous editorial reviews were too convincing. There was no way I wouldn’t love it just as much too, right? Tha price tag!!?? At that moment I thought… “Whatever!! I wanna read this!!”. Okay I was totally into the whole first half. The “arrival”, the news reports. Weeks of “hovering” with… nothing. This silence is deafening. Why did they come billions of miles just to stare at us? It’s rude. Society eventually carrying on as usual, even with this imminent threat. Nobody knew what to do. We figured the government sort of did. The government had a plan for everything, so we assumed they had a plan for E.T. showing up uninvited and unannounced, like the weird cousin nobody in the family likes to talk about. Some people nested. Some people ran. Some got married. Some got divorced. Some made babies. Some killed themselves. We walked around like zombies, blank-faced and robotic, unable to absorn the magnitude of what was happening. 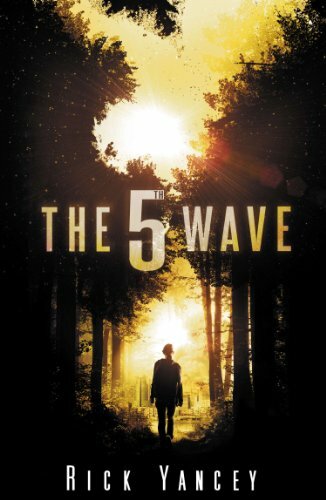 Living through Cassie’s eyes, experiencing that horror, being unlucky enough to live through it (believe me, when she insinuates that some were lucky enough to be killed in the first waves… WOW! I believed her). AWESOME!!!!! It wasn’t about saving us. And it wasn’t about enslaving us or herding us into reservations. It was about killing us. And then meeting “Evan” after weeks (months?) of being alone. This is what the Others have done to us. You can’t band together to fight without trust. And without trust there was no hope. Now I know I said I was in the mood for a side of romance, but I realize I was lying to myself. I wanted all of that horror and destruction and chaos, but I wanted the eventual romance in spades, too. When I said a “side of romance” what I meant was that I wanted the apocalyptic feel, and depth and seriousness of the story itself to remain dominant no matter how “romance–y” it got. BUT! I was craving shock-value in that romance, and in the reveals. I wanted to sigh, and I wanted to GASP in horror. I wanted to live it out with her, step by step. Pace it slowly so I soak in it and believe it… (or pace it quickly so I never catch my breath) that’s fine… BUT! I I think I wanted to be her, and only her, the entire time. After all, I was her for the whole first half, so to change it up the way it did, interrupted my connection to this story. I lost my feel of it. And I shouldn’t have, ’cause this book had a few reveals that could have given me that shock that I was craving. Twists and turns and plenty of danger, but it kept switching up the POV from the initial main character (Cassie), to her brother, to a recruit in the military, to Evan. It’s all connected mind you… but it broke up my rhythm. Sometimes it would be one character for a few chapters in a row, and sometimes it would switch up, chapter after chapter that it always took me a page or two to figure out “who I was” this time. Oh and the shooting battles. I know it has to happen (defense and all that). But I try and tune them out when I watch “shoot-’em-up” movies but it’s hard to tune it out in a book. Especially when amongst all of the shooting, and the strategizing there are reveals that will become clearer, so skimming is not recommended. But I couldn’t help skimming a few of the “danger missions” and missed out on the impact of a reveal or two. I “saw” them happen, understood what was revealed, even though it gets confusing and a bit convoluted (although that might be due to my skimming) but… I figured it out. Still though, knowing what happened, and feeling what happened are two different things, and I didn’t get the full impact. By that point, I was on the outside looking in. Bummer. Fantastic writing though. But apparently, I didn’t enjoy this story as much as the majority did. Possibly because it’s not my genre? But no… I like this kind of thing. Am I more of a “one character POV” reader? Could be. But USA Today’s quote (above) that had me buying it at all costs without the sample. No. This certainly didn’t give me that. Not yet, anyway. (P.S. I know what the sample consists of and I’ll tell you, that part is SO GOOD… I would have bought it anyway). Even the potential “romance” aspect didn’t… no. And I’m fine with YA, absolutely (I don’t need “detailed steam” to fall head-over-heels in love with a couple), but… I needed something. Something more than this. Sure, it had a side-of-romance but I didn’t feel it. However it did explore humanity via some very meaningful scenes, thought processes and conversations, so yes – life-lesson wise – this was eloquent. But by the time things came to a head, I wasn’t there yet. Potential thrills, but I think I missed out on feeling a bunch of ’em. And the end? Well… I was left a bit fuzzy on the details, and I know why, now. While it does have an “ending” it is also book #1 in an eventual series, so, you know. I have lots of questions left unanswered. Maybe I’ll like it more in book #2? Maybe. P.S. Overall “feel”? I’d say… A bit of “The Host” (I LOVED)/”The Hunger Games” (I LOVED)/”Starship Troopers” (not so loved). 😉 LOL! I actually just downloaded this. YA will always be my first love. Looking forward to seeing how our star ratings differ. I’m kind of a SciFi nerd. I hadn’t heard of this either until one day about a week ago I saw all the news stories about it! It does look like a great read and something that you have to know going into it is going to have less romance in it. I’m still interested in reading this one even though you had some struggles with it in the second half. I guess I just can’t bring myself to pass up on scifi when it is done in the YA genre which is rare. education of sebastion, and the education of caroline” this weekend. I really enjoyed the caroline sequel. I heard about this book a while ago and it’s on my list to read. Well, I’m on the waiting list at the library. I love a good sci-fi YA book! Maryse – Have your read Divergent? Since you said you loved The Hunger Games I thought you might like Divergent. I actually loved both, but Divergent even more. Thanks Cassie!! I’ve heard great things. I think it won best in one of the Goodreads 2012(2011?) categories, so I’ve been thinking about it. Divergent is also going to be a movie – My friend is the Art Director for the movie that they are filming right now in Chicago!